keys that create my world," "I focus on what I love," "I am right on track,"
characters comprising a mini-story in itself. stone to a purposeful life of creativity, lasting fulfillment and joy. Wonderful book! My 3 year old loved the illustrations! I highly recommend it! 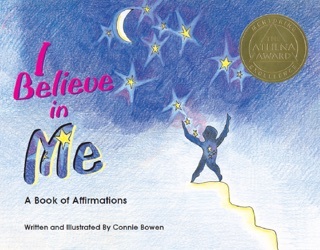 Although this is advertised as a children's "empowering" book of self-affirmations and illustrations, it is also a useful tool for adults! Connie Bowen's unique, whimsical illustrations transcend words, exemplifying her message that the limits of our imaginations are boundless. I happen to have the good fortune of knowing Connie Bowen, and I have known for years that she is an extremely talented artist and an encourager. Now, the rest of the world can marvel in and interpret her colorful drawings and, just like her friends, feel her warmth and encouragement through her affirmations. 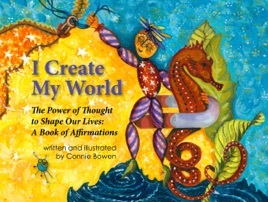 I downloaded "I Create My World" on my iPad so that I can carry my little buddy around with me all of the time. It's not as good as her sweet voice, but it will have to do. I highly recommend buying this book for any child in your life or, like me, for yourself!! !